This excellent work of art represents one of the portrait-types  pendant portraits, as the known scholar of Mughal art, Amina Okada, classified them, immensely popular at the court of the Mughal Emperor Jahangir, and the Emperor himself valued them high, perhaps, because these small icons involved greater artistic skill. It seems Jahangir loyalists, considering their Emperor's love for them, and believing that he would like it, wore them as pendants. Thus, of all portrait-types these small icons were more akin to Jahangir, and in them, better reflected his taste. Discovering a personality with multi-dimensionality, such as that of Jahangir, on a small piece of paper was a challenging job of which Hashim was the master amongst his court artists. Hashim had the ability to treat his subject with great precision, and at the same time he could quite objectively discover his figure's realism, psychological insight and retrospection. He had unmatched skill to control each part. He elaborated margins and borders but in treating his main subject he was exceptionally concise, sober and to the point, which defined the power of his renditions. As in early Indian Chaurapanchasika tradition, he preferred drawing his figures against a monochromic background. This contemporary work of art brings Hashim back on canvas. Here is Hashim's Jahangir, as also his Jesus. Jahangir, the world commander as he thought of himself, is holding in one of his hands a green globe symbolising the world abounding in great prosperity. A large size halo with golden rays radiating from it reveals not so much his divine status as the frame of his mind, which regarded him not only the monarch of the world but also the highest amongst spiritual beings. In the one-and-a-half-inch icon there manifests all that defines Mughal grandeur, sophistication and taste, and all that defines Jahangir, within and without. An elderly bearded Jesus plodding his path to crucifixion, as he has been usually represented in votive art, was not acceptable to Hashim. To him, he was the timeless youth glowing with divine aura, beyond death and decay, much in the spirit of the myth relating to 'Descent to hell', where Satan, engaged in dialogue with Death, warns Death against Jesus who would break Death's copper gates not only to let himself out but also all holy souls. In the modeling of the figure of Jahangir there reflects a monarch's shrewdness and in that of Jesus a saint's simplicity and humility. As against the richly gold embroidered drapery adorning the window below Jahangir, the window frieze containing the image of Jesus is balanced by a simple latticed screen. But for its fresher synthetic colours and a fresher look, this work re-produces the Hashim's masterpiece of circa 1620. It uses the same colour scheme, similar designing motifs and patterns including calligraphy, and exactly same modeling. In precision, finesse, balance and contrast it is as accomplished as the painting by Hashim. 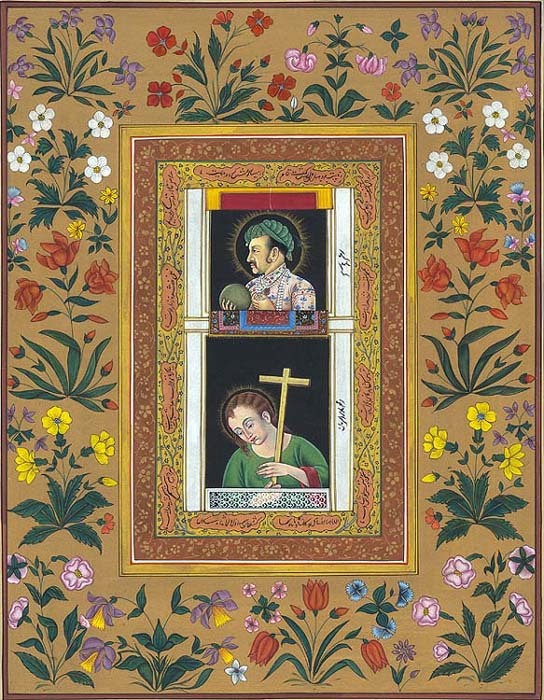 The figures of Jahangir and Jesus are drawn against the monochromic black background. Against this black, the green used in Jahangir's turban and gown of Jesus, variedly used red, gold, yellow and various tints of pink, have amazing effect. As from pistils radiate petals and bloom into a flower, so radiate from the figures of Jahangir and Jesus, axis of the painting, first a gold streaked white frame, then the golden comprising holy text and floral arabesques, then the pink with floral designs, and finally, the broad margin consisting of large size flower plants. Except for black and a small stripe of red, the colours are used largely in their lighter tones. This colour choice, so characteristic of Jahangir's art, is another feature that takes the viewing eye to his era.